When we think of clouds we think of those white cotton ball masses in the air. What we don’t really think about is what are clouds made of. We all know about the water cycle in some form. We know that clouds are created from the water that evaporates from various lakes, rivers, and oceans. We also know that at some time this evaporated water becomes rain and starts the cycle all over again. However there are important questions about clouds we overlook. First, how are clouds visible if water vapor is normally supposed to be invisible like air or at least dissipate quickly after the first gush of steam? Second, why do clouds last so long in their different forms? Finally, what gives clouds their white or grey colors? As you can see there is a lot we take for granted in our understanding of clouds and how they are formed. We know that clouds are made of water vapor, what we don’t know or at least forget is the important role that condensation plays in making clouds visible. For the most part water vapor is invisible. This is proven by the fact that the air we breathe regularly has some water vapor as part of its composition. However we don’t see it since its apart of the air. Condensation is what makes water vapor visible. Basically high temperatures excite water molecules until they change from a liquid state to a gaseous one. However lower temperatures can cause enough water vapor to condense back into liquid form. This small amount stays as very small droplets that can stay suspended in the air mostly thanks to small dust particles that they attach themselves to. It is pretty much the same way you see small bits of glitter suspended in clear glue. The drops are small enough to stay trapped in the air until condensation reaches a point of no return making rain. One result of this is that light becomes reflected and refracted. This is what makes clouds visible. Now if you think about it we also just answered the second question about why clouds last so long. You may understand the first explanation because you can see your breath on a cold day. However after a while depending on the weather you notice that later in the day you can no longer see your breath. Clouds are visible because of colder temperatures in the upper atmosphere. You have to remember that in the upper reaches of the atmosphere that the temperatures are much colder. This means that water vapor once condensed can no longer return fully to its gas state. Since temperatures don’t change in this region clouds are able to keep shape longer. Finally, clouds have color. Some are white, some are grey, and in special circumstances such as major storms can have weird colors like green or red. This goes back to refraction. Most color that we can see is visible because are eyes perceive how objects absorb or reflect certain wavelengths of light. The white colors of clouds come from the condensed water vapor having a high reflective quality. When all wavelengths of light are reflected back you see white. The grey color comes from seeing clouds from beneath. White clouds are white if you notice, on sunny days. This is because you can see the sunlight directly hitting them and see that light almost completely reflected back. On cloudy days most sunlight is blocked by the translucent and refractive quality of cloud cover. This makes clouds appear darker in color as part of the light has been uniformly absorbed. We have written many articles about clouds for Universe Today. Here’s an article about the types of clouds, and here’s an article about cirrocumulus clouds. If you’d like more info on clouds, check out an article aboutClouds. And here’s a link to NASA Spaceplace Page about Clouds. We’ve also recorded an episode of Astronomy Cast all about the Atmosphere. Listen here, Episode 151: Atmospheres. Here are some cool cloud pictures. Here’s a photo of mammatus clouds, taken by NASA. These are a type of cloud associated with thunderstorms and bad weather. Here’s a picture of lenticular clouds. This kind of cloud looks lens shaped, and sometimes even like a flying saucer. They form when moist air flows over top of a mountain, creating a series of standing waves in the atmosphere. If the temperature drops below the dew point, lenticular clouds may form. 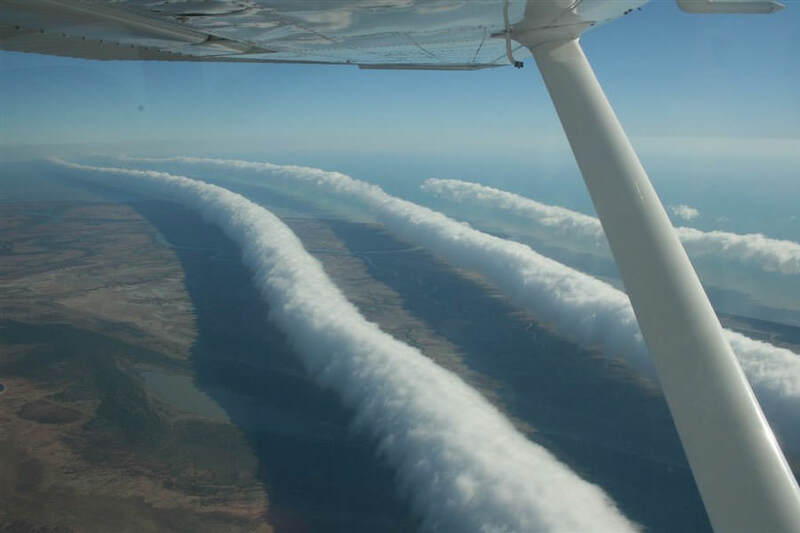 These are Morning Glory clouds, a very rare type of cloud formation seen in Australia. They look like long lines of rolling clouds moving across the landscape. They can be more than 1,000 km long and 1-2 km high. They move 60 km/h across the landscape. Scientists aren’t really certain how they form. Here’s a classic example of a cumulus clouds. These are the common fluffy white clouds we see when warm air rises and the moisture in the air condenses. This is an image of orographic clouds. These are formed when air masses are forced from low elevation to go over higher terrain like a mountain. As the air gains altitude, expands and cools forming clouds. We’ve written many articles about clouds for Universe Today. Here’s an article about how clouds are formed, and here’s an article about different types of clouds. If you’d like more information on clouds, check out NASA’s cloud gallery. And here’s a link to more information on clouds. We’ve also recorded an episode of Astronomy Cast about atmospheres. Listen here, Episode 151: Atmospheres.